This is an amusing one-shot volume that I picked up because of the title, “Holiday”. I took it to mean a vacation or something. Interestingly enough, the main story in this volume doesn’t have anything to do with any kind of holiday, however the last story does take place at Christmas time. Even so, I think the cover of the book gives off an entirely different feeling than the Christmas story, so I really have no idea why this book is called Holiday 🙂 There are two stories in this volume. The first one takes up several chapters, and is about the same couple. The last story is unrelated, but very cute. The main story features a high school girl named Yuki. Yuki has a problem. Well, make that 3 problems. The first is that she is small. Even though she is in high school, she looks like a young middle school student. Her next problem is that she is fashion-challenged. She is unable to pick out a flattering wardrobe if her life depended on it. She is the opposite of everything fashionable. This is particularly upsetting to her because she tries very hard, yet is a total failure. This leads to her lack of a boyfriend. Her third problem is Koudai, her childhood friend. He is, at 17, two years older than her, and he makes fun of her constantly. He treats her like a small pet, always ruffling her hair and patting her head. He is such a pain! Yuki has an immediate crisis when a male classmate asks Yuki if she would like to go to a movie with him. Yuki is so excited, she agrees immediately, and only realizes later that she has absolutely nothing to wear. In the ever-so-helpful way that shoujo manga guys have, Koudai offers to help Yuki, but she refuses, and naturally her shopping trip is a disaster, and leads to heartbreak. The amazing fashion sense of shoujo manga heroes always amazes me. They all seem to be super stylish, and possess ninja makeover skills. Koudai does have a better eye for clothes than Yuki, but he is actually far from perfect. Even though Koudai bothers Yuki a lot, she does depend on him a lot, and they are good friends who have known each other all their lives. Koudai is comfortable to be around, and they share a common interest, namely manga. Koudai is a closet otaku, with a secret manga habit that only Yuki can appreciate and tolerate. 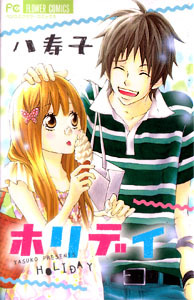 Yuki knows Koudai’s faults, and pretty much everything about him, except for one thing… his girlfriend. Koudai had a girlfriend, but they broke up. Yuki desperately wants to know what happened there, but he isn’t keen to tell. When fashion-disaster Yuki meets Atsuko, the beautiful girl Koudai used to date, she realizes her feelings for Koudai are stronger than she thought. But how could she ever compare to someone as fashionable, gorgeous, and amazing as Atsuko? Why did they break up? The last story in this volume is a funny story about a girl named Kubo-chan who is working at an amusement park during the Christmas season in order to make some extra money. Her job requires her to wear a silly Santa-themed dress. Kubo-chan’s job gets much more interesting when a new employee arrives to work with her. His name is Nakamura, and Kubo knows him! He is one of her classmates at school, and is the guy she likes! How amazing! What luck! Kubo is so excited about this opportunity! It must be fate! Nakamura is a laid-back, easy-going sort of guy. He is happy to see Kubo-chan and is very friendly. Kubo-chan is a very romantic and dreamy girl, and her silly idyllic daydreams amuse Nakamura. However, poor Kubo is about to have her dreamy good luck ruined when she discovers that Nakamura has a girlfriend, and he is working at the theme park to earn money for a present to give her! Oh, how awful! Poor Kubo-chan! Where are her romantic dreams now?